Thank you for inviting me to sunny, warm Louisiana all the way from cold, snowy Maine. I love coming here because you have these itty-bitty lobsters in every mud puddle, whereas we have to run out 50 feet of rope and a huge trap that requires periodic hauling. And they can’t make our lobstas into popcorn. You all also have oil and gas, America’s developmental elixir of prosperity for a century, whereas we have trees in abundance and wood stoves to supplement our prodigious oil heating bills. That is in part why Maine has gone from a leading economic state in 1900 to the back of the pack today. I worked with Jeff Schneider and Jimmy Jenkins when I ran National Fish and Wildlife Foundation, and Jerry Clark, your Assistant Secretary for Fisheries under Governor Roemer, was my deputy at NFWF. My Grandmother was a Labouisse from New Orleans so I have tangential family connections to Louisiana. I’m here to talk about empowering private land owners to utilize conservation, and I could just as easily talk about the oil and gas industry, which has underwritten conservation for 50 years without due credit, being potentially the future handmaiden for private land stewardship nationwide. There is a natural linkage between the two that is obvious and that needs retwining. Let me tell you where I’m coming from - aside from Maine - philosophically and experientially. I have worked in conservation for over 40 years, dating back to my first job in the Nixon administration with the office of Secretary of Interior. I spent time in U.S. Fish and Wildlife Service, National Audubon Society and, for 15 years, ran the programs of the National Fish and Wildlife Foundation. In 1999, I left NFWF and, to celebrate the incoming millennium, struck out on my own because I felt that the past 50 years’ ‘trajectory’ of conservation was coming to a dead end. For decades we have experienced an over concentration of assets and public policy focused on public acquisition and regulation. I was, and remain, convinced that, with the dawning of the 21st century, a new market focus will bring conservation leadership to private lands across America. I practice what I preach. Between 2000 and 2005 I was part of a team that successfully consummated the two largest conservation easements in the US – the Pingree project of 762,000 acres and the Downeast Lakes project of 342,000 acres of working forest lands, totaling together 1.1 million acres. How do we transition to this new market orientation? Why? The Why part is easy. Across the U.S., the public sector, both federal and state, is in a financial trough. At the federal level alone, the four land conservation management agencies stagger under an operations and maintenance backlog of $30 billion, which grows annually. Most states are in worse shape. Two years ago Texas, with one of our most robust state economies, cut Texas Parks and Wildlife Department’s budget 21%. From a geographic and ecological perspective, most of our public lands are at high elevations, which provide scenic grandeur, but an ecological desert of pine trees, rocks, ice and vast desert landscapes. Mon Dieu, not Louisiana! As Aldo Leopold wrote in his River of the Mother of God essays: “the geography of conservation is such that most of the best land will always be held privately for agricultural production. The bulk of responsibility for conservation thus necessarily devolves upon the private custodian, especially the farmer.”1 But our public policies do not recognize the preeminence of private landowner stewardship. Environmental leaders routinely characterize private landowners, particularly ranchers, as “bad guys,” just as they do in routinely excoriating the oil and gas industry. This brings us to the next question: How do we bring conservation to the farmers, ranchers, and forest owners of our generation? The environmental movement has been trying to tell people what to do with their land for years and it has often created a backlash of resentment, and federal and state agencies are always pushing THEIR agendas that often do not coincide with the needs and priorities of landowners. The Resources First Foundation (RFF) was created in the first quarter of 2000 with the intent of using the internet to empower land owners, and to bring a full spectrum of conservation information, goods and services to private landowners who serve, not incidentally, as the stewards of 71% of the lower 48 states today. Starting with this kernel of intuition and intent, coupled with a commitment to provide timely and accurate information in a neutral configuration without environmental advocacy, we launched the Private Landowner Network (PLN) in 2001 as our mother ship site. We launched just as the dot com world crumpled. Yet we are still alive, growing and building, and traffic has increased for ten straight years. Our two national sites, PLN and the Conservation Tax Center (CTC), are go- to sites with voluminous content. We host all the federal programs targeting private land owners from USDA and DOI; we host the comparable state programs, all the nonprofit sector: every conservation district, land trust and Ag extension office in the country, and for profit service providers - we now host some 27,000 businesses- including over 1,500 tax and estate attorneys and 3,300 consulting foresters-all on one easily accessible, free platform that is constantly updated. We shall be building the Louisiana Conservation Connection website for the next 9 months. I invite you all to send us preferred service providers and programs that you would like to see hosted on the site. I also invite anyone who thinks this site meritorious to consider sending RFF a contribution. We are a 501(c) 3, and we rely almost entirely on private financial support. Public land acquisition. Do we need it? I don’t think so. Since the early 70s the favorite environmental program of the national environmental groups, the Land and Water Conservation Fund, (LWCF, hereinafter), is authorized at $900 million per year, and subject to annual Congressional appropriations, which are never adequate in the minds of the environmental community. Today roughly 28% of the US is in public estate of the National Park Service (174 million acres), National Wildlife Refuge System (89 million acres), National Forest System (192 million acres), and BLM lands (247 million acres) for a total of 605 million acres in the federal conservation establishment. These four land management agencies host a land-based infrastructure that is falling down, literally. The Operations and Maintenance backlog for these agencies is $30 billion dollars!!! As I wrote this the Washington Post ran a front page story on 19 August 2012, headlined “National Parks Face Severe Funding Crunch.” Of course this is NPS playing the usual Washington monument stunt to game for larger budget allocations. The article notes: “after more than a decade of scrimping and deferring maintenance and construction projects-and absorbing a 6 percent budget cut in the past two years-the signs of strain are beginning to surface at National Parks across the country...Blue Ridge Parkway has a $385 million backlog, mainly in road maintenance...”3 Actually this has been going on for more than 25 years as the agencies and their environmental acolytes have pushed for more and more acquisition, while the infrastructure is falling down on the land they already have. LWCF has become a funding trough for the federal agencies and environmental co-conspirators under the guise of preservation. Today most parks have foundations or Friends groups associated with them. For example I grew up next to Acadia National Park on Mt. Desert Island, Maine. ?For twenty years the NPS was delinquent in keeping the carriage trails and hiking trails in repair. Finally, Friends of Acadia was created to underwrite the necessary investment in trail upkeep because the host agency was clearly not up to the task. Comparable efforts are in place today from Yosemite to Grand Teton. Sooo, instead of trying to make LWCF a permanent $900 million funding mechanism for real estate we do not need to add to the federal estate, as this Administration has made a priority for the last four years, I propose a federal conservation Marshal Plan to fix our maintenance backlog. How to fund it? In this day and age you have to provide a funding mechanism for any new initiative - it is called Pay-Fors in Congressional vernacular. I would recommend a national real estate surcharge of .050%; allocated .025% for sellers, .025% for buyers on all real estate transactions with disbursements split between the Feds and states for infrastructure rebuild. Comparable programs are in place in several states. Currently LWCF is funded from oil and gas receipts as the environmental movement likes making oil and gas industries the bogey man for all environmental ills. In my mind we ought to let the energy industry get on with making the U.S. energy independent, something the last six Presidents have failed to do. In today’s world the biggest threat to our conservation infrastructure is sprawling development gobbling up farmlands and forest lands, particularly on the periphery of our burgeoning metroplexes. Why not dun the source of the problem, real estate development, and make them become the financiers of maintaining our extensive conservation infrastructure and help rebuild our sagging parks, refuges, forests and BLM lands and state lands as well? This program could also be a major provider of both construction jobs and youth employment for trails and facilities maintenance for the long term. Why not make conservation infrastructure maintenance a major employer and provider of jobs for rural America? As a bird hunter, I always like killing two birds with one shot! “Three things are necessary. First, absolute solidarity. Second, an in-depth knowledge of the environmental movement. Third, fossil-energy companies have to seize the moral high ground. Providing 80% of the energy that sustains human civilization is nothing to apologize for.”6 Well said. Can you imagine the U.S. taking on both Nazi Germany and Tojo Japan in World War 11 simultaneously without domestic oil? Why did Hitler invade Russia and the Japanese the Dutch Antilles? And as previously noted fossil fuel companies have underwritten all the public land acquisition for the past 30 years. I would add a corollary to Dr. Deming’s tutorial: fossil energy companies should coalesce with farmers and foresters across rural America. Farmers know their Deere tractors don’t run on wind power, and from Louisiana to North Dakota the leasing of oil and gas today is predominantly on private lands , many of which remain in agricultural production and can be restored post drilling. As Dr. Deming suggests the oil industry could learn a lot from the NRA; the right to bear arms is emblazoned in the Constitution; the right for domestic energy independence, while not called for in the Constitution, should be a national priority of the first order. This brings me to a final point. Today we live in an era where the purveyance of fraudulent science is a national pastime aided and abetted by the media industry. I’ll mention one tiny example, a David and Goliath story featuring Kevin Lunny, an oyster farmer in Drakes Bay, California which has the discomfort of being grandfathered into Pt. Reyes National Seashore. For 7 years the National Park Service has engaged in a dishonest, fraudulent campaign to throw Mr. Lunny off his lease. Lunny operates a family ranch-overlooking the Estero where he was born, raised and has lived over 50 years. His grass is certified organic; his beef is organic and he runs the first ranch in California to be certified Salmon Safe. He employs 30 oyster workers. 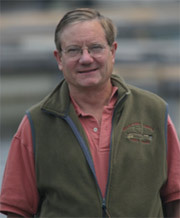 Lunny is the poster boy for land and water stewardship. Yet the NPS has spent millions in public money, probably tens of millions of dollars, trying to destroy this mans’ business through a campaign that is blatantly corrupt. This movie could be coming to your neighborhood. This has caught the notice of Louisiana’s junior senator, Senator Vitter, who has introduced legislation on behalf of restituting Mr. Lunny from the scientific misconduct of the highest levels of the National Park Service. Based on the Park Services felonious research Secretary Salazar recently cancelled the Lunny’s oyster farm permit. Fortunately the U.S. 9th Circuit granted a motion for emergency injunction to allow the oyster company to remain open while the court considers their appeal in Drakes Bay Oyster Company v. Salazar. Senator Vitter has introduced legislation to extend Mr. Lunny’s lease ten years in his Energy Production and Project Delivery Act of 2013. On 25 February, Sen. Vitter issued this statement: “Interior attempted to flat out kill this oyster farm and its jobs by using misleading science and ignoring economic impacts. I applaud the Ninth Circuit for taking this first step to recognizing that the Interior agency bureaucrats, including Ken Salazar, almost put people out of work for no good reason.”7 But this is becoming a pervasive societal problem. Peer reviews are ignored or manipulated. In 1999 Michael Mann in his famous global warming hockey stick graph touted by Al Gore managed to eviscerate the entire Medieval Warming Period for historical records, some 400 years of well-documented history. You face the spectre of much of this bogus science being used to justify new regulatory burdens on private land owners across America. Just ask Mr. Lunny if you want to glimpse the nightmarish imposition of a federal bureaucracy shutting down private enterprise. To return to my world of the Louisiana Conservation Connection and the Private Land owner Network, that is why we made the early decision in 2001 to not host ANY environmental advocacy on RFF’s websites. We are a neutral platform. Our mission statement is explicit to our purpose. The mission of the Resources First Foundation is to support and develop innovative conservation programs to strengthen and sustain rural communities, economies and green businesses, and to support private sector conservation initiatives. Please go to my blog, www.privatelandownernetwork.org/plnblog entitled “KEEP WORKING LANDS WORKING” to see our philosophy in print and hundreds of conservation stories of successful conservation stewards and entrepreneurs. Unlike most environmental groups who fill their coffers by promoting the next green crises, we believe in promoting success stories and the stewardship initiatives of American farm and forest owners. Dare I say it is a Jeffersonian vision, tacked onto the hard-bitten financial and entrepreneurial construct of Alexander Hamilton. There is an old Texas expression: “Don’t spit in the soup, we all got to eat”. Nobody puts bread and fiber on the table of America today like the farmers, ranchers and forest owners of this country, and it seems to me there should be a natural partnership between this tribe and the oil and gas industry. We all need to work together to move this country forward, and that means not stigmatizing certain industries, especially when they represent the fountainheads of our prosperity and competitiveness worldwide. 1. Leopold, Aldo. The River of the Mother of God; and other Essays. Edited by J. Baird Callicott and Susan L. Flader. University of Wisconsin Press, 1992. 2. Pension Protection Act of 2006: Title XII, Subtitle A., Section 1206. 3. Eilperin, Juliet, “National Parks Face Severe Funding Crunch.” Washington Post, ?August 19, 2012. 4. Hulen, Thomas, “Put Land Conservation on Par with Oil Drilling.” Azcentral.com. March 1, 2013. http://www.azcentral.com/opinions/articles/20130228land-conservation- oil- drilling.html?source=nletter-. 5. Deming, David. Black & White: Politically Incorrect Essays on Politics, Culture, Science, Religion, Energy, and the Environment. Self Published, 2011. 6. Deming, David. “What the Oil Business Could Learn From the NRA.” Wall Street Journal, March 1, 2013. 7. Bolar, Luke. Vitter Applauds Court Decision Blocking Interior’s Attempt to Close an Oyster Farm. US Senate Committee on Environment and Public Works: Press Release, February 25, 2013.